This entry was posted in 1895, HISTORY OF RECORDED MUSIC and tagged camden, eldridge johnson, emile berliner, fred gaisberg, setting up a record company, victor talking machine company by Nipper. Bookmark the permalink. Fantastic blog — where would the entertainment world be without that historic meeting between Gaisberg, Berliner, and Johnson? 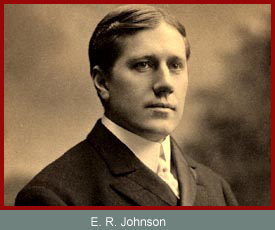 Many thanks for including him here — the EMI archive has some useful resources on Johnson as well, copies of about 30 years’ worth of his diaries, and many of the contracts between him and the Gramophone and Typewriter Company. Fascinating stuff! Fans of Johnson who happen to be in Delaware, Johnson’s home state, might be interested to know that his eponymous museum is once again open and operating on its old schedule. It was shut down almost completely following state budget cuts a couple years back (opening times were restricted to one day a month and for pre-booked school trips), but it’s back in business, and completely free! Some amazing things to see there if you’re ever in Dover, Delaware.